Although the population parameter estimation algorithm gives a rough estimation of the individual parameters, it can be estimated two more precise estimators: the conditional mode and the conditional distribution. 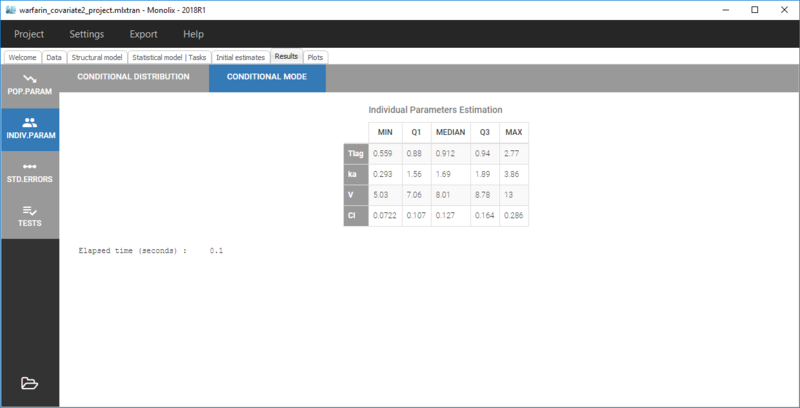 If the option ”Estimate the conditional modes” is selected, the individual parameters are estimated by maximizing the conditional probabilities , i.e. It corresponds to the “optimal” value for the fit. For each parameter, the mean of these quantities over all the subjects is displayed together with an interval. When the mean and the standard error does not vary anymore, we stop the draws. In the interface, a summary of the individual parameters is proposed (min, max and some quartiles) as shown in the figure below. individualParameters.txt. All the individual parameters for each subject-occasion from SAEM, the conditional mean and/or the conditional mode (with extensions _SAEM, _mean and _mode respectively) are written in that file. individualRandomEffects.txt. All the random effects for each subject-occasion from SAEM, the conditional mean and/or the conditional mode (with extensions _SAEM, _mean and _mode respectively) are written in that file. simulatedParameters.txt. All the simulated individual parameters are written in that file. A column rep is added to allow the simulation of several individual parameters for the same subject-occasion. simulatedRandomEffects.txt. All the simulated individual random effects are written in that file. A column rep is added to allow the simulation of several individual parameters for the same subject-occasion. Notice that the covariates are also added to each files for each subject-occasion. Best practices : When do we look at the conditional mode and when do we look at the conditional mean? The choice of using the conditional mean or conditional mode is arbitrary. By default, Monolix uses the conditional mode for computing predictions, taking the philosophy that the “most likely” values of the individual parameters are the most suited for computing the “most likely” predictions.